- Famous meteorologist in campaign "Family to the Seaside, Dog to the Street?!" urges, "Do not abandon animals!" A study published in the Current Biology magazine confirmed the well-known saying that a dog is man's best friend. During research, brain function of people and dogs were compared, and the result was that both species experience emotions when communicating, namely showing if they are sad or happy. Since dogs, like other animals, have emotions and feel, it is extremely cruel to toy with them and provoke feelings of abandonment, loneliness, worthlessness... which is exactly what some people do by abandoning their best friends. Rejected dogs and cats are left to suffer from hunger, thirst, injury and death by traffic. As a result, animal abandoning is recognized as a special form of animal abuse and it is punishable by a monetary amount of up to 15,000 HRK. Animal Friends has been drawing attention to this problem before the holidays for years now through the campaign "Family to the Seaside, Dog to the Street?!" This year, Darijo Brzoja joined their appeal. The young meteorologist and popular weather forecast presenter is the new face of the Animal Friends' summer campaign. As Brzoja is vegan through his life choice, he explains his compassion towards all animals with these words: "I believe that the highest form of humanity is to give a voice to those who don't have one. This is why taking part in this Animal Friends' campaign is an honour for me, but also a natural continuation of my life philosophy: love and compassion towards people, animals and our whole little blue planet." 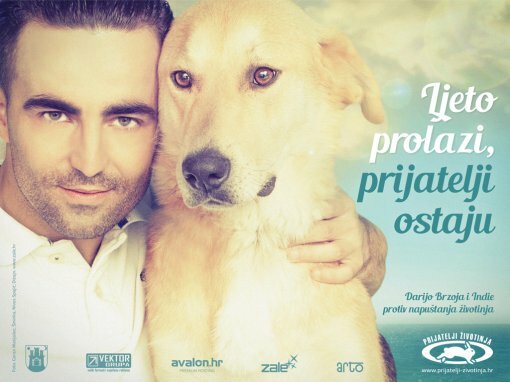 Darijo Brzoja with his new friend, a dog named Indie from the Zagreb City Shelter for Abandoned Animals in Dumovac, appears on billboards and City Light ads in Croatian towns, encouraging everyone with the slogan "Summer Goes, Friends Stay" to never abandon animals. As a representative of abandoned dogs, Indie invites people to, instead of buying, adopt one of the many dogs in shelters, whose love and devotion have no price. In Croatia, there is still a large number of abandoned animals present throughout the year, and especially during the summer months. There is a lack of shelters for abandoned animals with a no-kill policy as well as educational and adoption programs. 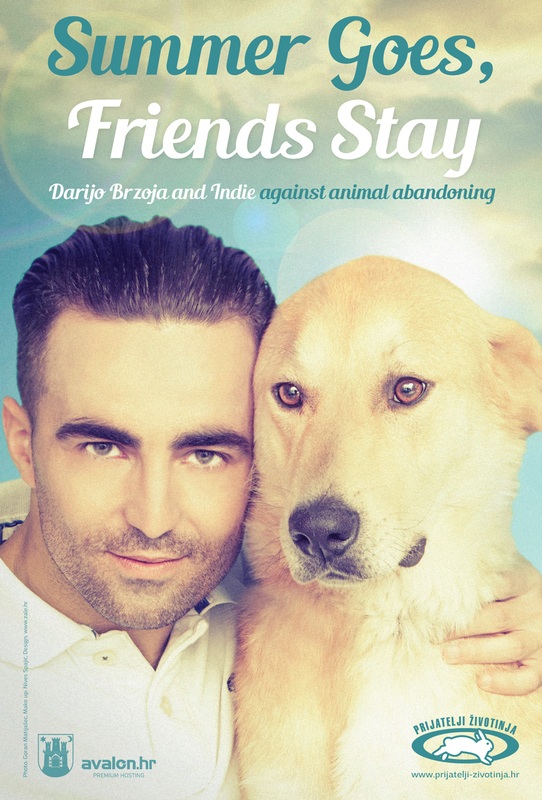 Darijo Brzoja and Animal Friends appeal to citizens to not abandon their animal family members but to instead take them on holiday during the summer months or to take care of them by finding temporary accommodation with family members, friends, someone who will look after them, or hotels for dogs. Darijo Brzoja believes that, with just a little bit of goodwill and timely planning, this is possible: "For me 'dog=family,' but there are those who don't see it that way. As we are living in a very exciting period of society development, I believe that people’s hearts are opening and that campaigns like this one will not be needed in future." The warm relationship between Darijo and Indie was photographed for this poster by Goran Marijasec, and make-up artist Nives Spajic took care of Darijo’s look. Ads were designed by Maja Zaklan. Classifieds for adoption of animals and for temporary homes, as well as the list of hotels for dogs and hotels that allow dogs can be found at www.prijatelji-zivotinja.hr. This campaign has been made possible in collaboration and with the support of the City Office for Agriculture and Forestry of the City of Zagreb, the Zagreb City Shelter for Abandoned Animals in Dumovec, Europlakat, Arto, Design Studio Zale, Vector Design, Avalon and Nova TV.